First introduced in 1955 as the Model 740A, in 1960 it was changed to model 742 and introduced in many calibers, including .30-06, .243, .308 and .280 REM. Made in various deluxe and presentation grades. We manufacture an oversize 10-shot magazine for the calibers listed. 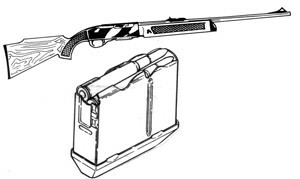 The magazine will not hold the slide open on the last round for the 7600 series rifle. Fits new model 750 but will not hold slide back on last round.